In 2003, the wide range of materials on Pier Paolo Pasolini – as a poet, novelist, writer, filmmaker and playwright – and his works found a permanent home in the city of his birth. The Cineteca’s library now houses more than 1200 volumes on Pasolini’s films and writings along with an archive of photos, audiovisual materials, magazines, catalogs, press cuttings, dissertations and recordings of conferences, debates, speeches and radio programs. After Pasolini’s tragic death, actress Laura Betti founded the Associazione Fondo Pier Paolo Pasolini di Roma (Pier Paolo Pasolini Association of Rome) for promoting his work through international conferences, retrospectives and publications. The association’s impressive archive was donated by Betti to the City of Bologna in 2003, and that same year she formed the Pier Paolo Pasolini Research Center – Archive. The Pasolini Archive also includes the “Betti Donation”, a collection of photos, personal objects and documents belonging to the great actress and bequeathed to the archive by Betti’s brother Sergio Trombetti after her death in 2004. The Pier Paolo Pasolini Association organizes "Premi Pasolini", prizes for the best dissertations on the work of the poet-director. An award is also given to an artist whose work shares an affinity with Pasolini’s vision. The Association organizes retrospectives and conferences abroad every year. The most recent ones were held in Munich, Helsinki, Cracow, Lisbon, Zurich, Istanbul, Seoul, Nuremberg, Oslo, New York and Karlsruhe. 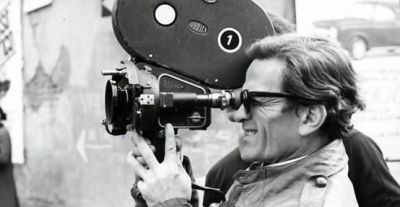 The Pasolini Association has worked on a number of publications: a monograph on Laura Betti, Illuminata di nero (Cineteca Speciale, 2005), as well as books published in partnership with the National Cinema Museum in Turin (Pasolini: un cinema di poesia, 2006), with FMR-Franco Maria Ricci in Bologna (Pasolini, Callas e "Medea", 2007), with City Lights (San Francisco) - Titivillus (Perugia) (Pasolini - Poet of Ashes, 2007). Exhibitions curated by the Pasolini Association include Una strategia del linciaggio e delle mistificazioni. L'immagine di Pasolini nelle deformazioni mediatiche (Bologna, 2005), based on journalistic documents from 1949 to 2000 and illustrations by Gianluigi Toccafondo. The Association has also collaborated on several photography exhibitions: Pasolini und der Tod (2005), with the Pinakothek der Moderne in Munich; Pasolini: un cinema di poesia (2006), with the National Cinema Museum in Turin; Pasolini e O Evangelho segundo Mateus (2006), with the Cinemateca in Lisbon (photos by Angelo Novi and Antonio Masotti); Pasolini, Callas e "Medea" (2007) with FMR - Franco Maria Ricci (photos by Mario Tursi); Pasolini: the Body's Truth (2007) with the Italian Cultural Institute of New York (photos by Angelo Novi). Each month the Research Center and the Pasolini Association organize an event at the Cineteca’s Cinema Lumière featuring Pasolini scholars and the presentation of films or audiovisual dossiers on the work of the poet-director.